GEOFFREY CIANI: Hello boxing fans. This is Geoff Ciani from East Side Boxing, and I am here today with junior welterweight contender Cleotis Pendarvis. How’s everything going today, Cleotis? CLEOTIS PENDARVIS: Oh, it’s going on man. It’s going fine. It’s going well. You know I’m just toning it down. Camp went well. I’m basically ready. CIANI: Great! Now your big fight coming up this weekend against Dierry Jean is an IBF eliminator bout that will be televised on Showtime. You said camp went well and that you’re basically ready. Can you tell us a little bit more about your training and preparations? PENDARVIS: You know just in and out on a daily basis putting the miles in, the sparring in. One of the chief sparring partners was Shane Mosley and I brought in some young talent, which is around the same age as myself, very strong and powerful guys just to prepare me for the best Dierry Jean come May 10. I put in the work and did everything that I felt like I needed to do, and now camp is toning down. I’m ready to fly out and go out there and put on a performance for the world. CIANI: How does it feel for you to get this opportunity to showcase your talents to a televised audience, and also to be fighting in a title eliminator? PENDARVIS: It feels great. You know it feels great just to have this opportunity. I’m very thankful for it, and to be in this position. You couldn’t have asked to be in a better position in your life coming from where I’m coming from. You know being from the east side of Los Angeles is a struggle, and being from the gutter and everything, it’s a blessing. So I feel like it’s time to step up to the plate and do what I have to do and prove myself out there to the world, and the boxing critics, and everybody that studies the game, follows the game, the fans, and so on. It’s just my time. I’ve been in the ring with the best in the world helping to prepare for fights in the past, and things of that nature. I’ve been with a new team, a new squad, Pitt Bull Promotions and manager Warren Wilkerson, and we have all been putting in the work to get to this point and now it’s time to take it to the next level. I understand that Dierry Jean is undefeated or whatnot, but he hasn’t danced with the devil yet. He hasn’t been in there with a real one, and when I say a “real one”, I mean a real fighter that can take a punch, and give his licks back, is just as sharp, can see punches before they come, can dish it out, and is an all around entertainer in the ring. So it’s time to go do what I do. CIANI: Now you mentioned before that Shane Mosley was one of the guys who helped you in your training and preparations. Was there anything specific that a future Hall of Famer and veteran like Mosley was able to teach you, or anything you were able to learn from those experiences to help better prepare you? PENDARVIS: Well, I mean of course! The craftiness of a Hall of Famer, they always teach you to keep your eyes sharp and be ready, and be ready for anything. You know a lot of people count Shane out because he took a couple of L’s and lost to Canelo and things of that nature and stuff, but he still has it. He still has the speed, he still has the pop, and I’m not just saying that because he was my chief sparring partner. I’m saying it because I respect his game. He’s a multi-division world champion, he beat a lot of greats, and he lost to a lot of greats, but at the end of the day he’s still one of my favorite fighters of all time, just for his work ethic and the things that he does. You know I was in camp with Shane before helping him prepare for Zab Judah. Of course that fight never happened, but I was in camp and I learned a lot from him in that camp. And you know, for me to have my own camp and him to come help me and be my chief sparring partner, I take my hat off to him and I just want to say thanks. CIANI: Now your opponent coming up, Dierry Jean, what do you think of him? What is your opinion on him as a fighter, and what do you think he brings to the table that could be challenging for you? PENDARVIS: I don’t think he brings anything to the table that’s challenging to me. You know like I said, I’ve been in the ring with the best in the world. I have fought undefeated prospects before and beat them—knocked them out, actually. He’s another man, and he’s in the way of myself feeding my kids, even on my team eating, and I’m not having that. They disrespected me because I’m 17-3 with 6 KOs, and things. My first half of my career was at welterweight and junior middleweight. You know I was coming down because I was a football star at 200 pounds. So I fought a lot of heavier guys, and I beat a lot of heavier guys. Now I’m at my legit weight and I’ve been stopping a lot of guys. In my last fight I stopped Michael Clark, which is a veteran of the game, 43-7 with 20-something knockouts. And he beat a lot of guys in the game and also fought for world titles and stuff like that, and I had Michael Clark quit on his school. You know Dierry Jean, I don’t feel like he poses a threat to me. They may feel he does, his promoters, and the people from Canada and stuff like that, but me—nah! You know I’ve seen the film. I’ve seen what he does. He has a good right hand, and he comes in the fight always in shape, and he tries to apply pressure and things like that. He does some slick things and things of that nature, but it ain’t nothing I have never seen in the ring before. It ain’t nothing I’m not used to. I’m from California. You know. I’ve been around the best in the world. I’ve been on the east coast, I’ve been on the west coast, the Midwest, things, and so on. So you know it’s just what it is. It’s nothing. It’s just a fight that I have to prepare for and be ready for, and I’m ready for the best Dierry Jean come May 10; and he better be ready for the best Cleotis Pendarvis, because I’m definitely willing to put it all on the line to come out with the ‘W’ man. For real! CIANI: You mentioned your last fight against Michael Clark, which was back in December of last year. When you look back at that fight against a veteran of his caliber, how do you evaluate your performance in that one? PENDARVIS: I give myself a B. You know I always critique myself. I didn’t start slow. I was a little bit more cautious and things like that. He’s a veteran. You know, he still has a lot of tricks of the trade, and he beat a lot of good prospects. Still, even after the fight we had, he came back and beat a prospect and won another regional title. But it was just that when he stepped in there with King Cleotis Pendarvis, it was something different. I take my hat off to him with respect, but at the same time I went right back to the gym and got right back to the drawing board, and started working on my craft, and studying my craft, watching film, and things of that nature, because I want to be the best. I want to beat the best out there, and in order to be the best and beat the best you have to train like the best. You know Floyd Mayweather’s not on top of the game because he decided to not train; he’s on top of the game because he decided to go out and do what he has to do to be the best. You know he wasn’t always like that, but he made a decision to choose up, and he chose the right thing to do. The reason why I use Floyd Mayweather as an example, I mean I’m not going to be like Adrien Broner and try to emulate everything he does. I’m just saying I respect his business savvy and his whole work ethic about being a professional fighter, because it’s no joke being a professional fighter. You have to take care of your business inside and outside the ring, and before anything most definitely outside the ring. You have to eat right, sleep, think, and everything has to be about boxing. That’s what I learned, and that’s what I’m starting to put myself in that atmosphere of just everything is about the game, the sport of boxing. It’s an individual sport. It’s a man’s sport. You have to be ready. It’s chess, not checkers. And that’s what I’m here to do. I’m here to prove myself, and I have to. We got a lot of good fighters at 140: Lamont Peterson, Danny Garcia, and all those guys. Also we got guys that might be moved up by the time I get to the world title, but if they’re not then I got to beat them, and I got to go study and do what I have to do with the craft before I can beat them. CIANI: Now you mentioned some of those guys at 140. In your estimation right now, when you look at the whole landscape in that division, is there one fighter in your view that is top dog in the division right now? PENDARVIS: No. There is no such thing as the top. We’re all fighters. We just got to go out there and prove themselves. Everybody out there is beatable right now. There is nobody. There’s no Ray Leonards, or no Sweet Pea Whitakers, or things like that out there right now. Those guys all have losses and they definitely all are beatable. I see it. I see it! I watch it. I study it. That’s why it starts with Dierry Jean come May 10. CIANI: Now curiously, two of the people you mentioned will be fighting the week after you, and that of course is Lucas Matthysse and Lamont Peterson. What are your thoughts on that fight, and do you favor one fighter over the other in that contest? PENDARVIS: No, I don’t favor neither one of those guys. They both are fighters. I have mad respect for both of their skills. It’s a boxer-puncher type of thing. Lamont has to go out and use his jab, stay out of harm’s way, and do what he does. He has to box! He was a boxer earlier in his career, then he decided to start walking guys down, and the best he had every looked was against Kendall Holt, and it’s not easy to stop Kendall Holt. You know he’s a power-puncher himself, but he went out there and did what he had to do and he looked real good in that fight. Lucas Matthysse—I mean come on! You know. This dude’s like 32-2 with 30 knockouts. So his record speaks for itself. He’s a threat to anybody at 140, but at the same time, just because you’re a puncher doesn’t mean it makes you Superman. He can be beat! He’s 32-2, so that means there were two guys that he came up short against, and that’s Zab Judah and Devon Alexander, and they both are boxers. So that says a lot in itself. Lamont just has to go out there and be smart, and like I said before it’s chess, not checkers. CIANI: I also have to ask you Cleotis, you mentioned Floyd Mayweather before. Last night he put on a pretty damn good performance against Robert Guerrero. What did you think of Floyd, especially there were a lot of questions about him? He’s 36, he had another year long layoff, he had spent some time in prison. What did you think of his performance? PENDARVIS: Floyd Mayweather did great last night. It was a professional performance. A lot of people want to second-guess Floyd and say things about Floyd, because they want to see him lose. It hurts to see somebody that put the work in like that, and talks, and backs up everything he says—just like Muhammad Ali. You know a lot of people paid to see Ali lose, because it’s just that they couldn’t believe he was that great and they didn’t want to believe he was that great. But the man put in the work and did what he had to do. No matter how long of a layoff Floyd had. You know he had a long layoff when he came back and smashed Juan Manuel Marquez. And nobody smashes Marquez like that! Nobody! Nobody in the game has ever done that to Marquez, and Floyd came back and made it look like a sparring session, and then he came back and did the same thing with Robert Guerrero. And you know, I got respect for ‘The Ghost’, because The Ghost is a tough rugged guy. But at the same time, that shows you the difference between an elite fighter and a great fighter. Floyd Mayweather is a great fighter; Robert Guerrero is an elite fighter. CIANI: Back to your upcoming bout, what do you think are your keys to victory for you to be successful this weekend? PENDARVIS: I have to have patience adapting to whatever he does, being smart. You can’t really go out there and just pinpoint anything, because it’s a fight. You never know what could happen in a fight. I’d have been down and gotten up to have to win before. I’d have been low-blowed, I’d have been rabbit-punched, and everything in a fight for guys to beat me, but I have to stand my ground and do what I have to do to beat those kinds of things. That’s what it is. It’s about adapting to whatever the opponent has in front of you, outsmarting him, and beating him to the punch. I can’t really just put no particular way of beating this guy. Whatever he brings to the table, all I can say is I have the answer for it. I have the answer for it. CIANI: You’re going on 27 years old now. What would you ultimately like to accomplish in professional boxing before all is said and done with your career? 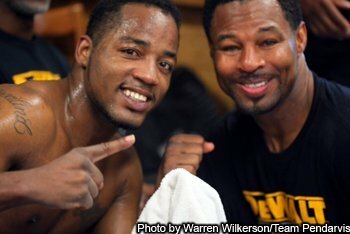 PENDARVIS: I’m going to go down as one of the greatest fighters to ever put on a pair of gloves. A lot of fighters started off bad in their careers, or I can say had a shaky road: Bernard Hopkins, Manny Pacquiao, those guys turned their careers around, Margarito, and so on. You know I don’t train to lose. I don’t train to lose anymore. Like I said, I’m 17-3. It’s all hard work and determination, and that’s a true saying when it comes from the camps of all the champions: the Haglers, the Leonards, and even before their time with Ray Robinson, and Jack Johnson, and Joe Louis, and guys of that nature, and Walcott, and all of those guys put in work to be great. And that’s what I plan on doing. I want to be great in this sport! I don’t want to just be a journeyman, or have them say I was a good fighter who had a chance, and things of that nature. You know I want to go out there and prove myself to the world. I come from the east side of Los Angeles, south central LA. It’s deadly out there! Gangs, violence, the street—you know, you’re not supposed to make it. You’re not! It’s made for you not to make it where I come from. The schooling, the teachers, and everything, it’s just all bad. So I’ve been fighting everyday for my life in and outside the ring, and I’m fighting for my kids right now—my son and my daughter. This dude Dierry Jean don’t even know what he got himself into, man. When they signed that contract, they signed that contract because they thought that this was going to be an easy contest. This is not a contest. This is a fight! This is what we do. You got to understand when you step in the ring with a man that has nothing to lose and so much to gain, you’re stepping in the ring with death almost. CIANI: Do you have an official prediction for your upcoming fight this weekend? PENDARVIS: My prediction is Cleotis Pendarvis with the W, introducing myself to the world, and entertaining the world come May 10. Dierry Jean—thank you man! Thank you for underestimating me. Thank Greg Cohen and all your camp for thinking that this is going to be easy money for you guys—that you are just going to come out there, and do your thing, and get that number one position. I’m glad ya’ll looking at the fight like that. Ya’ll doing me a favor! CIANI: Cleotis, I just have one final question for you. Is there anything else you would like to say to all the boxing fans out there and all the readers of East Side Boxing? PENDARVIS: Follow me on this journey. It’s not a sprint. It’s not a marathon. It’s a journey of my life. It’s real. I’m not going to give you guys a prima donna story or get out there and try and imitate the next man to make myself something that I’m not. I’m coming straight from Los Angeles and I’m introducing myself to ya’ll as who I am. You know I’m not trying to sound tough. I’m not trying to sound like I’m the biggest, I’m the baddest. I just want you all to know that I’m a dream catcher, just like everybody else, anybody that felt like they came from something and wanted to become somebody. I’m just like you. I’m just a human. Understand that I respect that much. I make mistakes, I’m not perfect, everybody does. But this is the boxing business, a professional sport, and the more and more that people follow me and understand that I’m trying—well, I’m beyond trying—I’m doing what I have to do, and I feel like I’ll win ya’ll over. You know you guys will pay to put your butts in those seats and see a young man as myself completely grow. I’m 26 years old. I got time in the game, and it doesn’t stop. Most definitely I want to shout out all the fans. I want to shout out everybody around the world, no matter what race, or where you’re from. It doesn’t matter. Everybody, if you believe in yourself, continue on! Go forward and don’t look back, man. It doesn’t matter. Life is not easy at all, because if it was easy from day one, Adam and Eve, you know they showed what it really was, and that’s just that. I’m going to shout out my team again: Pitt Bull Promotions, my manager Warren Wilkerson, my PR, my publicist, Rachel Charles, and my coaching staff, East Side Boxing, and everybody around the world, and last but not least, my kids! Daddy loves ya’ll, and this definitely is for ya’ll. CIANI: Cleotis, it was an absolute pleasure getting the opportunity to speak here with you today. I wish you the best of luck in your contest this weekend, and the best of luck in your career going forward. I look forward to it. PENDARVIS: Thanks a lot, boss. And I definitely appreciate you, Geoff. Have a good day, man. And you know, if there’s anything, give it to God, boss. That’s all I got to say. Previous boxing news: Mayweather defeats Guerrero: Boring is a matter of Opinion, Winning is a matter of Fact! Next boxing news: Left-Hook Lounge: Vivek Wallace touches on Mayweather/Guerrero, Canelo, Ortiz, & Rosado vs Love!